The lessons we can learn from 'old school' journalism great Clark Davey: Michael's essay: "He had a death ray stare through those round glasses that could curdle milk. Every time he stared my way, I grabbed the phone and muttered something like,"Of course, Mr. Mayor." Vaccine skepticism has a long history and we must understand it to combat it: That famous now-discredited 1998 study linking vaccines to autism is not the sole cause of anti-vax sentiment. 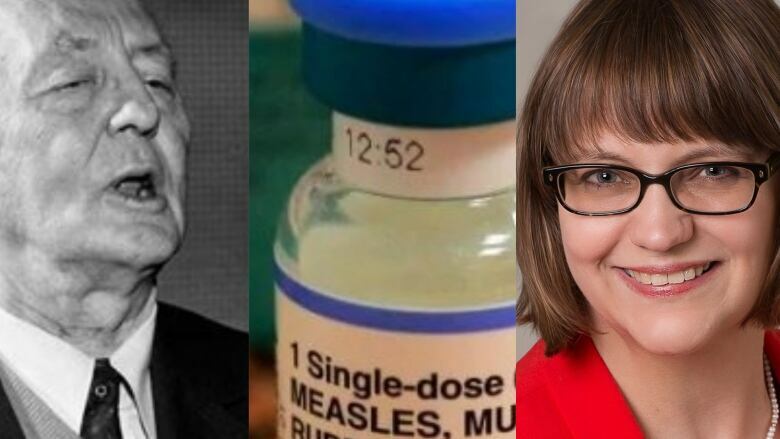 Heather MacDougall is a medical historian who has studied the roots of vaccine hesitancy. She says a range of powerful forces — from the thalidomide crisis, to Quebec nationalism, to government apathy — have shaped parents' fears about vaccines. From radio host to award-winning author to part-time dishwasher: Bill Richardson finds peace and contentment up to his armpits in suds. "It's relentless, it's repetitive, it's dull, it's loud: like most Wagner operas, now that I think of it." Bill's essay is called, "The Pit." With an eye on the past, Quebec traditional music is reinventing itself — again: Les Poules à Colin is a hip band of young musicians with their own take on traditional Québécois music. As David Gutnick's documentary profile explains, they are very 21st century but their roots go very deep. Big Brother is watching you! But most of us don't seem to care: Our smartphones, tablets, computers and appliances give corporations enormous amounts of data about where we go, who we know, what we watch, what we buy and evermore intimate details about our lives. Brenda McPhail, director of the Privacy, Surveillance and Technology Project at the Canadian Civil Liberties Association, says we are "sleepwalking into surveillance." Revisiting Hugh MacLennan's novel about complicated love, fighting fascism and 1930s Montreal: In episode 4 of The Backlist, our continuing series about Canadian novels that deserve a second look, Michael Enright speaks to long-time publisher and editor Doug Gibson about Hugh MacLennan's 1958 novel The Watch That Ends the Night. Remembering Ken Nordine: For more than 40 years, Ken Nordine hosted a late-night public radio program from Chicago called "Word Jazz". It was a mix of spoken word, poetry and sound design. Nordine's smooth baritone and unusual way of looking at the world built a passionately loyal following. In 2011, Michael talked to jazz aficionado Jack Chambers about Nordine, who died recently at the age of 98. More mail about violence in schools: We had an unprecedented response to Alisa Siegel's documentary about violent children in elementary schools, from teachers who feel threatened and from concerned parents. Music this week by: G.F. Handel, Mark Eisenman, Maurice Ravel, k.d. lang, Jackie Shane and Les Poules à Colin.